Some early morning breaks in the overcast, otherwise cloudy. High near 80F. Winds SSE at 10 to 15 mph.. Partial cloudiness early, with scattered showers and thunderstorms overnight. Low 66F. Winds SE at 5 to 10 mph. Chance of rain 50%. A recommendation from Gov. John Bel Edwards during his address on Jan. 7 to the Press Club of Baton Rouge set the stage for what could be one of the more contentious battles in the 2019 legislative session. Gov. Edwards announced he will ask legislators to approve a hike in the minimum wage from the rate of $7.25 per hour to $8 by 2020 and $8.50 by 2021. The proposal has been on the governor’s agenda since he took office in 2016. A measure to increase the minimum wage to $15 per hour failed resoundingly in a House Labor Committee last year, while a proposal to hike it to $8.50 an hour faltered in 2017. 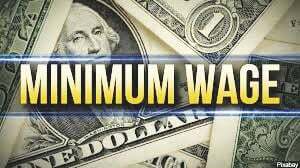 Louisiana and four other states – Alabama, Mississippi, South Carolina and Tennessee – have not adopted minimum wage laws. The proposal likely will get a large degree of pushback from pro-business lobbyist groups such as the Louisiana Association of Business and Industry, among others. It may garner support from legislators with a more defined urban area – New Orleans, Baton Rouge and Shreveport, perhaps – but it likely will take draw far more opposition from lawmakers in rural areas. The areas outside the metropolitan and suburban areas have become the last bastion of local “mom and pop” retailers, which have become a dying breed in the more densely populated locales. Gov. Edwards has already said he will rally heavily for the wage hike this year. He may find leverage from pointing to two Republican states that instituted minimum wage laws – Arkansas and Missouri. It may help him to some degree, but it certainly does not mean party members always vote the same way, either. It’s more likely, however, that the wage law will lead to a similar debate that has played out at the Capitol in recent years. One side will argue that $7.25 an hour hardly amounts to anything of value for the worker. The other will say minimum wage jobs are not meant to be permanent employment. Perhaps the biggest question: How will it play out during an election year? Expect a passionate and heated debate from both sides on this issue during the 2019 session.